So, who are we? 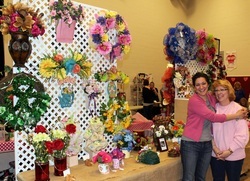 We're a mother-daughter team that makes flowers during visits together. Meredith Singleton (the daughter) lives in Kentucky. Donna Rudolph (the mother) has retired to the mountains of North Carolina where she finds inspiration to craft these beautiful arrangements and wreaths. We travel to shows and sell our items online just for fun! Curious if we can make this or that? Just ask! We'll do our best to make exactly what you're looking for.